A homely beach haven, Villa Ruby Rawai, nestled amidst Nai Harn and Rawai, is a three-bedroom retreat which is a 15-minutes’ walk away from Nai Harn beach and its sandy shores! This single-storey home is laid out in a way that each bedroom as well as the living and dining spaces open out directly to the poolside. Thus, providing you easy access to the swimming pool and the outdoor sala! The interiors of the villa are minimal sporting simple colours but with a pop of ruby red as seen in the details. Located close to plenty of shops, restaurants, and bars, the villa is convenient as well as it is comfortable! Three air-conditioned bedrooms, two furnished with king-sized beds and one with single beds, are each found directly accessible from the pool via glass doors. Sporting mostly neutral colours, the ruby red décor is hard to miss and makes the bedroom alive with colours. The comfortable ambiance allows you to easily adjust to your new surroundings so you can rest up and replenish. One of the bedrooms even has an additional single bed so it can accommodate one more person. Each bedroom comes with an en-suite bathroom fitted with all amenities. Flanked by a small, well-manicured garden with bordering foliage, the 8-metre swimming pool has a mosaic-tiled floor reflected on the surface. Under clear blue skies, lay back in the pool and lose yourself in the skies above, dappled with cotton candy clouds. Guests can relax on the sun chairs found on the deck, ideal for sunbathing, reading, or even taking a much-deserved nap! 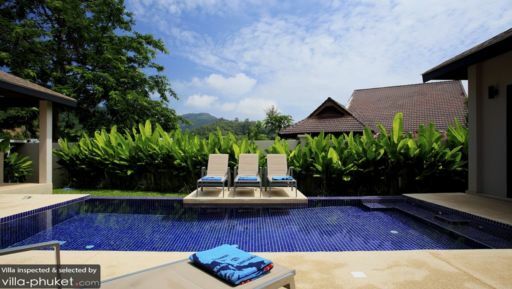 Poolside, you will also find a traditional Thai sala with an alfresco dining area as well as seating to enjoy the serenity and soothing sounds of nature. 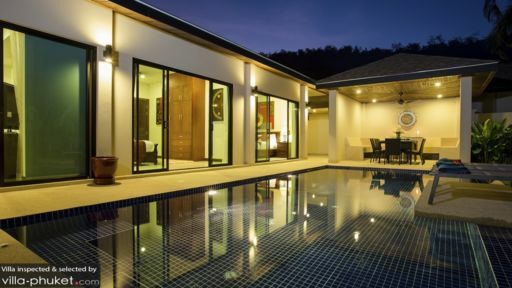 All the indoor spaces at Villa Ruby Rawai are located poolside with sliding glass doors that lead you to the deck. The main living room at the villa is no exception as it not only allows you undeterred views of the outdoors, but the comfortable and inviting interiors make this an excellent communal space. Furnished with faux leather sectional sofa, Thai artwork gracing its walls, false ceiling lights, air-conditioning, etc. the living room is where guests would have a memorable evening or two with friends and family! To keep you entertained, you can even watch films or TV shows on the flat-screen. Just behind the seating is the indoor dining area at the villa, thus, leaving you with not one but two dining options; amidst the luscious nature or in an air-conditioned room! The eight-seater dining table is appropriate for all guests so that everyone can eat without a hassle. The open-plan kitchen is the corner is fully-equipped with all sorts of modern and western amenities. It even has a breakfast bar as well as barstools perfect for quick bites and drinks. Villa Ruby Rawai not only provides cosy living quarters but also offers the services of a team experienced in catering to your needs. From housekeeping to management, everything is well looked after. To be enthralled by the skills of a personal chef in the kitchen, you can make a request for the same at an additional cost! Massages in-house are possible as well so indulge away and book your next spa treatment. 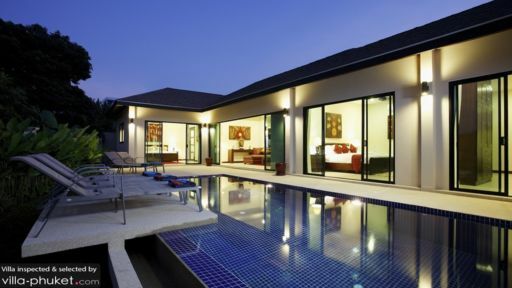 The villa is a 15-minutes’ walk or a short ride away from Nai Harn beach, where tranquillity is what will surprise as it is not as busy as other beaches in Phuket. There are plenty of beach restaurants, bars, and cafes you can explore in the area that are frequented by tourists!